NASA's next huge space telescope passed a major mirror milestone this week on its path to become the world's most powerful space observatory when it launches in 2018. Engineers completed coating 21 mirrors that will make up NASA's flagship James Webb Space Telescope with the thin — but vital — layer of gold that will reflect the faint infrared light collected by the observatory from the most distant reaches of the universe. "It represents not just the coating event but the completion of a huge engineering project," John Mather, the telescope's senior project scientist, told SPACE.com. "The mirrors are spectacularly new technology." Each of the 21 hexagonal mirror segments is almost the height of a person (4.9-feet, or 1.5 meters tall) and is made of beryllium, a material chosen for its light weight, stiffness and ability to withstand huge changes in temperature without warping. Eighteen of the segments will be combined into one giant 21.3-foot (6.5-meter) tall primary mirror. The remaining three mirrors will be used elsewhere in the telescope, NASA officials said. In June 2010, engineers began the process of coating each mirror with about 0.12 ounces of gold, applied in layers only 120 nanometers thick — about a millionth of an inch, or 200 times thinner than a human hair. Completing this process is a triumph for the beleaguered Webb telescope project, which has been delayed repeatedly and seen its costs rise significantly. The observatory, a joint venture of NASA, the European Space Agency and the Canadian Space Agency, is named after former NASA administrator James Webb, who ushered the agency through most of the Apollo era. The cost for the telescope is now estimated at $8.7 billion. Because of the project's budget overruns and delays, a House Appropriations Committee spending bill in July proposed to cancel the mission. A Senate subcommittee measure approved Sept. 14, however, would provide enough money to continue the project. 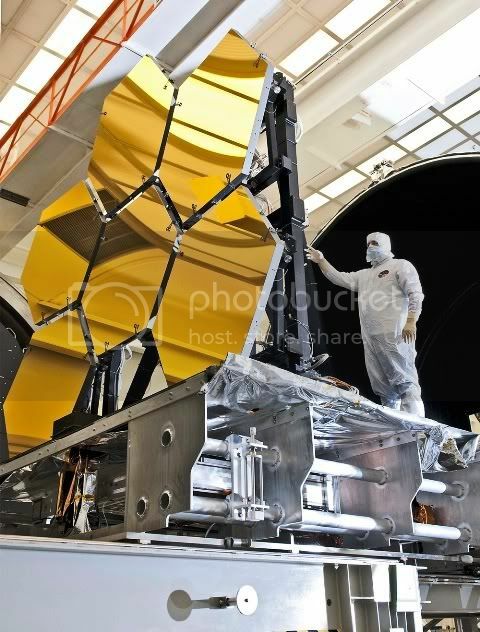 "Finishing all mirror coatings on schedule is another major success story for the Webb telescope mirrors," Lee Feinberg, NASA Optical Telescope Element manager for the Webb telescope at the agency’s Goddard Space Flight Center in Greenbelt, Md., said in a statement. "These coatings easily meet their specifications, ensuring even more scientific discovery potential for the Webb telescope." NASA’s Hubble Space Telescope has confirmed the existence of a completely new type of planet. By analyzing the previously identified world GJ 1214b -- an Earth-like superplanet located outside of our solar system -- astronomer Zachory Berta and his team have discovered a strangely unique water-based planet. When it comes to planets, our solar system contains three distinct types: rocky and terrestrial like Mars and Earth, gas giants such as Jupiter and Saturn, and ice giants like Uranus and Neptune. GJ 1214b, researchers soon realized, was none of the above. “If you want to describe in one sentence what this planet is, it’s a big, hot ocean,” Harvard University astronomer David Charbonneau told Wired in 2009 when the planet was first discovered by the MEarth Project, an NSF-funded, robotic observatory in Arizona. Since the planet is too far to be seen directly, researchers have had to infer its presence and characteristics from subtle distortions in light. As such, Berta and his crew have only recently been able to determine the planet’s steamy atmosphere. “We’re using Hubble to measure the infrared color of the sunset on this world,” Berta explained. He found the spectrum of GJ 1214b to be featureless across many colors, a model consistent with a dense atmosphere composed of water vapor. “The Hubble measurements really tip the balance in favor of a steamy atmosphere,” he said. The result is a water world very different to our own, one where the atmosphere is roughly ten times thicker creating extreme atmospheric pressures with little light getting through. “The high temperatures and high pressures would form exotic materials like ‘hot ice’ or ‘superfluid water’ -- substances that are completely alien to our everyday experience,” Berta said. Life too, if it exists, will certainly be weird. “I don’t want to imply that there’s any indication of life as we know it. It might have life, but it would have to be a strange kind of life,” Charbonneau told Wired. Some scientists claim that life could not exist on a huge planet because the superheavy gravity would crush anything. I personally don't agree with that because I think that life would evolve to adapt to whatever conditions were on the planet...just like creatures on Earth do. There are marine organisms at the bottom of the ocean that are able to survive under all of that water pressure so why could something survive on an extra large planet? Especially if it was covered with huge oceans like this waterworld planet supposedly is? I bet there is life there for sure. NASA successfully launched five suborbital sounding rockets from its Wallops Flight Facility in Virginia as part of a study of the upper level jet stream. This image was captured on March 27, 2012. The first rocket was launched at 4:58 a.m. EDT and each subsequent rocket was launched 80 seconds apart. 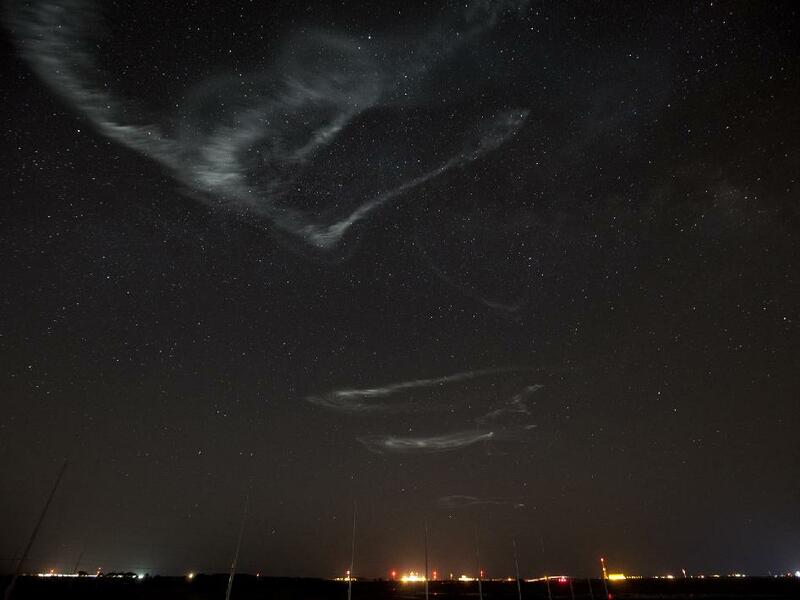 Each rocket released a chemical tracer that created milky, white clouds at the edge of space. Tracking the way the clouds move can help scientists understand the movement of the winds some 65 miles up in the sky, which in turn will help create better models of the electromagnetic regions of space that can damage man-made satellites and disrupt communications systems. The launches and clouds were reported to be seen from as far south as Wilmington, N.C.; west to Charlestown, W. Va.; and north to Buffalo, N.Y. The NASA/ESA Hubble Space Telescope has spotted the "UFO Galaxy." 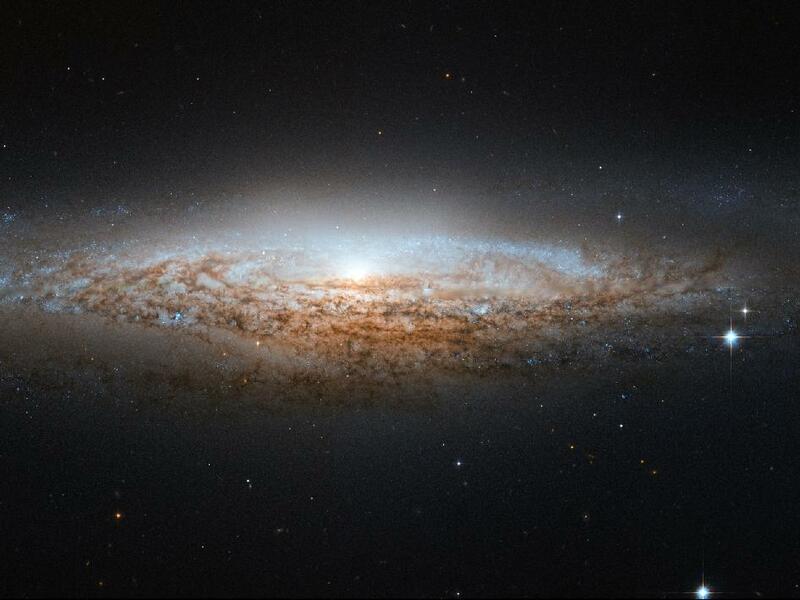 NGC 2683 is a spiral galaxy seen almost edge-on, giving it the shape of a classic science fiction spaceship. This is why the astronomers at the Astronaut Memorial Planetarium and Observatory, Cocoa, Fla., gave it this attention-grabbing nickname. While a bird's eye view lets us see the detailed structure of a galaxy (such as this Hubble image of a barred spiral), a side-on view has its own perks. In particular, it gives astronomers a great opportunity to see the delicate dusty lanes of the spiral arms silhouetted against the golden haze of the galaxy’s core. In addition, brilliant clusters of young blue stars shine scattered throughout the disc, mapping the galaxy’s star-forming regions. Perhaps surprisingly, side-on views of galaxies like this one do not prevent astronomers from deducing their structures. Studies of the properties of the light coming from NGC 2683 suggest that this is a barred spiral galaxy, even though the angle we see it at does not let us see this directly. This image is produced from two adjacent fields observed in visible and infrared light by Hubble’s Advanced Camera for Surveys. A narrow strip which appears slightly blurred and crosses most the image horizontally is a result of a gap between Hubble’s detectors. This strip has been patched using images from observations of the galaxy made by ground-based telescopes, which show significantly less detail. The field of view is approximately 6.5 by 3.3 arcminutes. From my untrained eye the galaxy appears too dense to penetrate. These four Hubble Space Telescope views are part of a massive mosaic of the Tarantula nebula released on April 17, 2012. They show: the young star cluster NGC 2070 (top left), star cluster NGC 2060 (bottom left), Hodge 301 star cluster (top right), and the region RMC 136, which is home to massive stars. 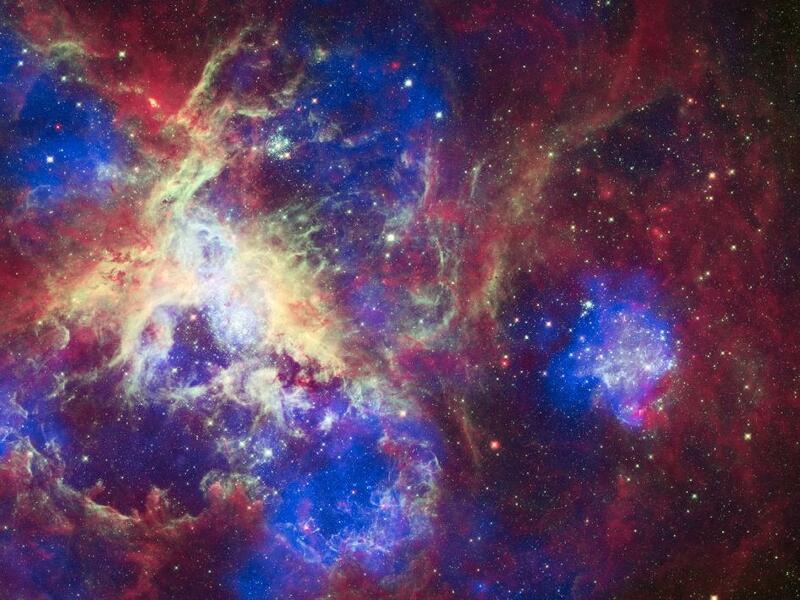 A stunning new photo from the Hubble Space Telescope has captured an unprecedented paannamic view of the Tarantula nebula, revealing its bright heart of massive stars. The photo is actually a colossal mosaic — one of the largest ever built from Hubble images — and shows an intense star-forming hotspot called 30 Doradus. Hubble's science team unveiled the image today (April 17) ahead of the 22nd anniversary of the iconic space telescope's launch on April 24, 1990. "30 Doradus is the brightest star-forming region in our galactic neighborhood and home to the most massive stars ever seen," Hubble telescope officials wrote in an image description. "No known star-forming region in our galaxy is as large or as prolific as 30 Doradus." The image covers an area about 650 light-years across that includes so many stars that their mass would add up to millions of our own sun if combined, they added. (One light-year is the distance light travels in a year, about 6 trillion miles, or 10 trillion kilometers). The Tarantula nebula is located 170,000 light-years from Earth in the Large Magellanic Cloud, one of the smaller satellite galaxies that hover around our own Milky Way. 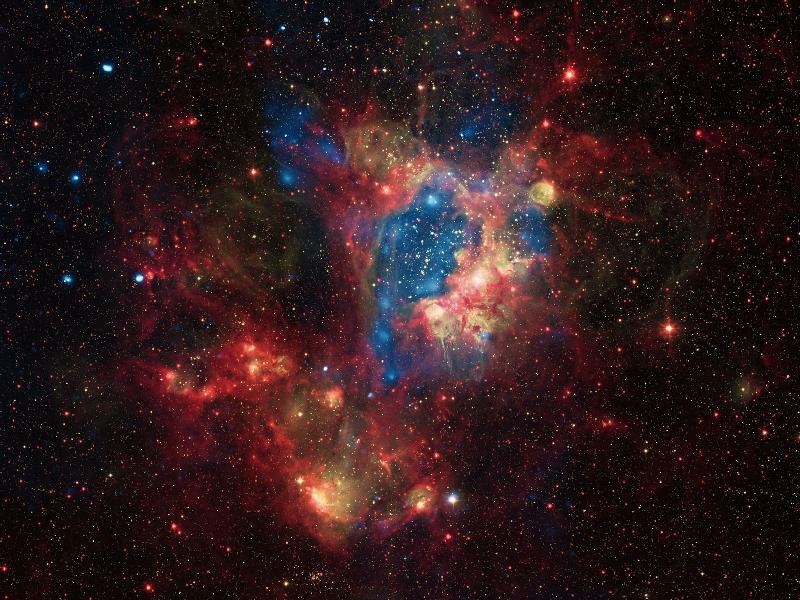 Inside the nebula is 30 Doradus, which, because of its local proximity to our galaxy, has long been a cosmic laboratory of sorts for astronomers studying how stars are born and evolve. A watercolour fantasyland? No. It's actually a photograph of the centre of the Swan Nebula, or M17, a hotbed of newly born stars wrapped in colourful blankets of glowing gas and cradled in an enormous cold, dark hydrogen cloud. This stunning picture was taken by the newly installed Advanced Camera for Surveys (ACS) aboard the NASA/ESA Hubble Space Telescope. 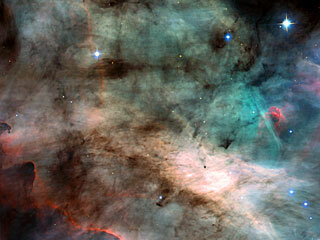 The region of the nebula shown in this picture is about 3500 times wider than our Solar System. The area also represents about 60 percent of the total view captured by ACS. The nebula resides 5500 light-years away in the constellation Sagittarius. Like its famous cousin in Orion, the Swan Nebula is illuminated by ultraviolet radiation from young, massive stars - each about six times hotter and 30 times more massive than the Sun - located just beyond the upper right corner of the image. The powerful radiation from these stars evaporates and erodes the dense cloud of cold gas within which the stars formed. The blistered walls of the hollow cloud shine primarily in the blue, green, and red light emitted by excited atoms of hydrogen, nitrogen, oxygen, and sulphur. Particularly striking is the rose-like feature, seen to the right of centre, which glows in the red light emitted by hydrogen and sulphur. As the infant stars evaporate the surrounding cloud, they expose dense pockets of gas that may contain developing stars. Because these dense pockets are more resistant to the withering radiation than the surrounding cloud, they appear as sculptures in the walls of the cloud or as isolated islands in a sea of glowing gas. One isolated pocket is seen at the centre of the brightest region of the nebula and is about 10 times larger than our Solar System. Other dense pockets of gas have formed the remarkable feature jutting inward from the left edge of the image, which resembles the famous Horsehead Nebula in Orion. The ACS made this observation on 1 and 2 April 2002. The colour image is constructed from four separate images taken in these filters: blue, near infrared, hydrogen alpha, and doubly ionised oxygen. Space Telescope imagery is free for anyone to use. To celebrate its 22nd anniversary in orbit, the Hubble Space Telescope released a dramatic new image of the star-forming region 30 Doradus, also known as the Tarantula Nebula because its glowing filaments resemble spider legs. A new image from all three of NASA's Great Observatories--Chandra, Hubble, and Spitzer--has also been created to mark the event. The nebula is located in the neighboring galaxy called the Large Magellanic Cloud, and is one of the largest star-forming regions located close to the Milky Way. At the center of 30 Doradus, thousands of massive stars are blowing off material and producing intense radiation along with powerful winds. The Chandra X-ray Observatory detects gas that has been heated to millions of degrees by these stellar winds and also by supernova explosions. These X-rays, colored blue in this composite image, come from shock fronts--similar to sonic booms--formed by this high-energy stellar activity. The Hubble data in the composite image, colored green, reveals the light from these massive stars along with different stages of star birth, including embryonic stars a few thousand years old still wrapped in cocoons of dark gas. Infrared emission data from Spitzer, seen in red, shows cooler gas and dust that have giant bubbles carved into them. These bubbles are sculpted by the same searing radiation and strong winds that comes from the massive stars at the center of 30 Doradus. Image Credits: X-ray: NASA/CXC/PSU/L.Townsley et al. ; Optical: NASA/STScI; Infrared: NASA/JPL/PSU/L.Townsley et al. Happy Birthday to me! Launched 22 years ago by the #Discovery Shuttle! 22 years ago today, the Hubble Space Telescope launched into orbit. After overcoming initial problems, Hubble has gone on to become legendary, helping scientists to rewrite astronomy textbooks. To celebrate Hubble’s 22nd anniversary, here’s a slideshow from ESA’s Hubblecast that shows some of the best images from over two decades in orbit, set to specially commissioned music. This mottled landscape showing the impact crater Tycho is among the most violent-looking places on our moon. Astronomers didn't aim NASA's Hubble Space Telescope to study Tycho, however. The image was taken in preparation to observe the transit of Venus across the sun's face on June 5-6. Hubble cannot look at the sun directly, so astronomers are planning to point the telescope at the Earth's moon, using it as a mirror to capture reflected sunlight and isolate the small fraction of the light that passes through Venus's atmosphere. Imprinted on that small amount of light are the fingerprints of the planet's atmospheric makeup. These observations will mimic a technique that is already being used to sample the atmospheres of giant planets outside our solar system passing in front of their stars. In the case of the Venus transit observations, astronomers already know the chemical makeup of Venus's atmosphere, and that it does not show signs of life on the planet. But the Venus transit will be used to test whether this technique will have a chance of detecting the very faint fingerprints of an Earth-like planet, even one that might be habitable for life, outside our solar system that similarly transits its own star. Venus is an excellent proxy because it is similar in size and mass to our planet. The astronomers will use an arsenal of Hubble instruments, the Advanced Camera for Surveys, Wide Field Camera 3, and Space Telescope Imaging Spectrograph, to view the transit in a range of wavelengths, from ultraviolet to near-infrared light. During the transit, Hubble will snap images and perform spectroscopy, dividing the sunlight into its constituent colors, which could yield information about the makeup of Venus's atmosphere. Hubble will observe the moon for seven hours, before, during, and after the transit so the astronomers can compare the data. Astronomers need the long observation because they are looking for extremely faint spectral signatures. Only 1/100,000th of the sunlight will filter through Venus's atmosphere and be reflected off the moon. The Hubble Space Telescope captured a crowd of stars that looks rather like a stadium darkened before a show, lit only by the flashbulbs of the audience’s cameras. Yet the many stars of this object, known as Messier 107, are not a fleeting phenomenon, at least by human reckoning of time -- these ancient stars have gleamed for many billions of years. ,br /> Messier 107 is one of more than 150 globular star clusters found around the disc of the Milky Way galaxy. These spherical collections each contain hundreds of thousands of extremely old stars and are among the oldest objects in the Milky Way. The origin of globular clusters and their impact on galactic evolution remains somewhat unclear, so astronomers continue to study them. ,br /> Messier 107 can be found in the constellation of Ophiuchus (The Serpent Bearer) and is located about 20,000 light-years from our solar system. ,br /> French astronomer Pierre Méchain first noted the object in 1782, and British astronomer William Herschel documented it independently a year later. A Canadian astronomer, Helen Sawyer Hogg, added Messier 107 to Charles Messier's famous astronomical catalogue in 1947.
,br /> This picture was obtained with the Wide Field Camera of Hubble’s Advanced Camera for Surveys. Many years ago I was laying back on the hood of my car with a pair of binoculars here in Missouri and I was fortunate to see the space shuttle directly overhead. It let out the Hubble Space Telescope out of it's cargo bay. That was quite a site ! I could distinctly see the bright reflection of the solar panels on the Hubble when they opened it up soon after. I'm hoping to see the James Webb Telescope do the same if all the conditions happen to be right. That picture is awesome! I love seeing photos of outer space. Even the mundane ones (is there such a thing?) look cool. I agree, it's beautiful ! Like the article states, Charles Messier was a major contributor to astronomy . He mainly searched for comets and discovered 13 in his career. He is still known even today mainly because of the objects he cataloged , which to be exact was 113. The reason he logged all of these objects is because while searching for comets these faint ,diffuse, fuzzy objects always appeared and were a hindrance because they resembled comets so much in earlier crude instruments. The cluster above is M (Messier) 107. Even with smaller telescopes or binoculars on the market today most of these objects show up quite well and are fairly easy to find . This composite image shows a superbubble in the Large Magellanic Cloud (LMC), a small satellite galaxy of the Milky Way located about 160,000 light years from Earth. Many new stars, some of them very massive, are forming in the star cluster NGC 1929, which is embedded in the nebula N44, so named because it is the 44th nebula in a catalog of such objects in the Magellanic Clouds. The massive stars produce intense radiation, expel matter at high speeds, and race through their evolution to explode as supernovas. The winds and supernova shock waves carve out huge cavities called superbubbles in the surrounding gas. X-rays from NASA's Chandra X-ray Observatory (blue) show hot regions created by these winds and shocks, while infrared data from NASA's Spitzer Space Telescope (red) outline where the dust and cooler gas are found. The optical light from the 2.2-m Max-Planck-ESO telescope (yellow) in Chile shows where ultraviolet radiation from hot, young stars is causing gas in the nebula to glow. A long-running problem in high-energy astrophysics has been that some superbubbles in the LMC, including N44, give off a lot more X-rays than expected from models of their structure. These models assume that hot, X-ray emitting gas has been produced by winds from massive stars and the remains of several supernovas. A Chandra study published in 2011 showed that there are two extra sources of N44’s X-ray emission not included in these models: supernova shock waves striking the walls of the cavities, and hot material evaporating from the cavity walls. The Chandra observations also show no evidence for an enhancement of elements heavier than hydrogen and helium in the cavities, thus ruling out this possibility as a third explanation for the bright X-ray emission. Only with long observations making full use of the capabilities of Chandra has it now become possible to distinguish between different sources of the X-rays produced by superbubbles. 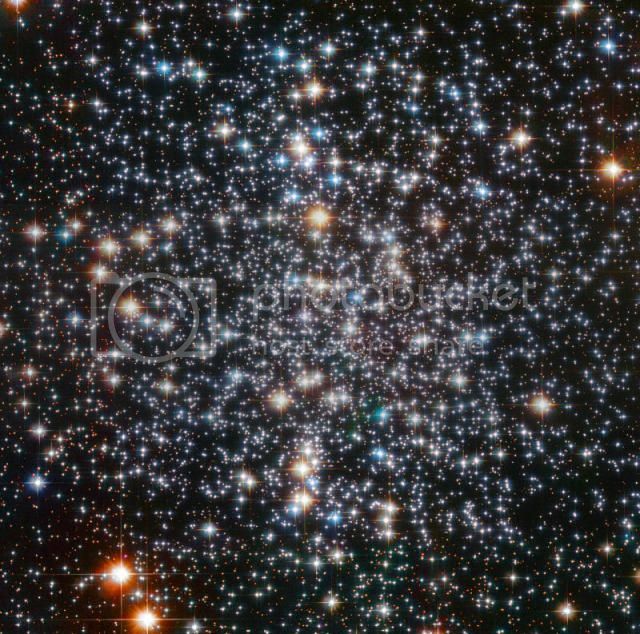 ScienceDaily (Sep. 7, 2012) — A sparkling picture taken by the NASA/ESA Hubble Space Telescope shows the center of globular cluster M 4. The power of Hubble has resolved the cluster into a multitude of glowing orbs, each a colossal nuclear furnace. M 4 is relatively close to us, lying 7200 light-years distant, making it a prime object for study. It contains several tens of thousands stars and is noteworthy in being home to many white dwarfs -- the cores of ancient, dying stars whose outer layers have drifted away into space. In July 2003, Hubble helped make the astounding discovery of a planet called PSR B1620-26 b, 2.5 times the mass of Jupiter, which is located in this cluster. Its age is estimated to be around 13 billion years -- almost three times as old as the Solar System! It is also unusual in that it orbits a binary system of a white dwarf and a pulsar (a type of neutron star). Amateur stargazers may like to track M 4 down in the night sky. Use binoculars or a small telescope to scan the skies near the orange-red star Antares in Scorpius. 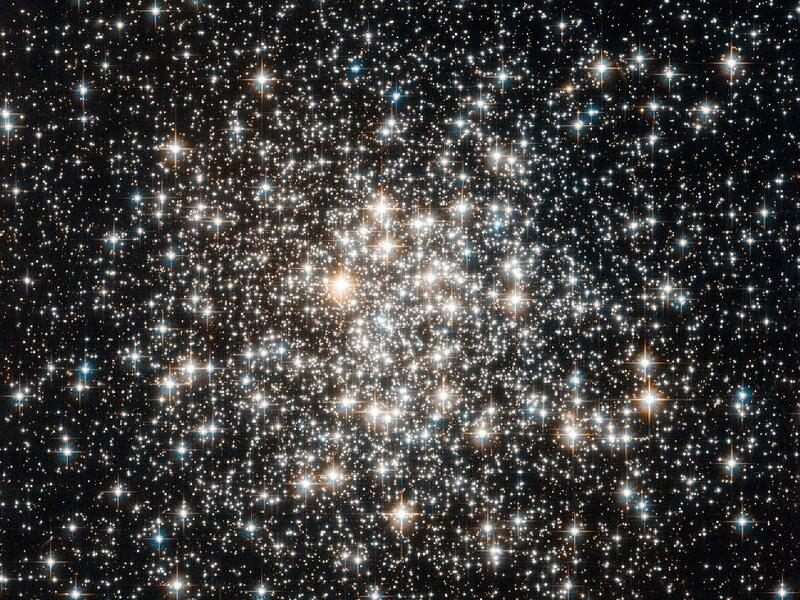 M 4 is bright for a globular cluster, but it won't look anything like Hubble's detailed image: it will appear as a fuzzy ball of light in your eyepiece. Professor Michio Kaku explains, what is the Unknown object. Dr. Kaku is a world renowned theoretical physicist. Probably one of the Smartest people in the world. I been saying this for 20 years now. I knew it way back then when I first listen to him. I knew we would see a lot of him in the future. Also could not wait to see his future unfold. thanks for posting auntym. I guess if they are in the dark , it could very well be a ship the size of a football field. That size has been told by many ufo witnesses. Even in the phoenix event. This collision in question happened in 2009.A similar collision happened in 2010 with about the same results. The other was called asteroid 596 Scheila. Electromagnetic UVOT Spectral Analysis points to an asteroid when comparing composition. Lack of ice was another factor which ruled out a comet. Gazing into the sky on a clear night is a favorite pastime of many. And a collection of dazzling photographs released this year by NASA makes it easy to see why. The stunning images, primarily captured by the agency's Hubble Space Telescope, show swirling palettes of colored gas, dust and countless stars as they sparkle in space. Many of the visually spectacular formations are the result of cosmic collisions - where a smaller galaxy plunges right through the heart of a larger one, shooting out the other side. As the traveling galaxy passes through the center of its bigger neighbor, it sets up gravitational ripples that disrupt red and blue clouds of gas and dust and trigger the formation of new stars. I absolutely agree ! Thanks Auntym, Swamprat too ! It was Swamprat's Sept.,2012 post on this thread about M4 which encouraged me to go out and find it which led to the most memorable night I've ever had in all the years of observing. After viewing it close to the star called Antares in the constellation of Scorpius, I then continued on through that night into the next morning observing over 30 deep sky objects just casually taking my time enjoying the most awesome views I've ever witnessed. If it wouldn't have been for that post it probably wouldn't have happened. Atmospheric conditions that night were exceptionally rare. I went on to post an observation report that next evening which was read by both amateur and professional Astronomers Internationally. I could have received an award for it but haven't accepted it,,,, yet . Have you ever wondered where those wonderful colors come from? A typical Hubble image is made from a combination of black-and-white images representing different colors of light. Taking color pictures with the Hubble Space Telescope is much more complex than taking color pictures with a traditional camera. For one thing, Hubble doesn't use color film — in fact, it doesn't use film at all. Rather, its cameras record light from the universe with special electronic detectors. These detectors produce images of the cosmos not in color, but in shades of black and white. Finished color images are actually combinations of two or more black-and-white exposures to which color has been added during image processing. The colors in Hubble images, which are assigned for various reasons, aren't always what we'd see if we were able to visit the imaged objects in a spacecraft. We often use color as a tool, whether it is to enhance an object's detail or to visualize what ordinarily could never be seen by the human eye. Color in Hubble images is used to highlight interesting features of the celestial object being studied. It is added to the separate black-and-white exposures that are combined to make the final image. Creating color images out of the original black-and-white exposures is equal parts art and science. • To bring out an object's subtle details. The colors in this image of a galaxy were chosen to simulate the colors that our eyes might see if we were able to visit it in a spacecraft. Representative color helps scientists visualize what would otherwise be invisible, such as the appearance of an object in infrared light. Enhancing the visible colors in an image often brings out an object's subtle structural detail.